Hoshyar Zebari appeared before the Security Council Thursday, two days after he was named part of the 33-member interim government that will assume sovereignty from the U.S.-led coalition on June 30. "I stress that any premature departure of international troops would lead to chaos and the real possibility of a civil war in Iraq," Zebari said. "This would cause a humanitarian crisis and provide a foothold for terrorists." But Zebari tempered his support for the more than 150,000 foreign troops in Iraq by calling for the U.S.-British draft resolution on the restoration of Iraqi sovereignty to be more specific about the powers of the interim government and its relationship with the multinational force. He said the resolution must underline "the transfer of full sovereignty to the people of Iraq" and authorize the interim government "to control, administer and manage Iraq's resources and assets." Zebari also indicated support for former Iraqi Governing Council member Ahmad Chalabi, calling him "a friend" of the new interim government. Chalabi has been shunned by his American backers and now faces accusations of passing secret information to Iran. 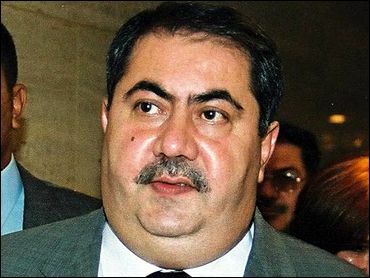 In a CBS News Up To The Minute interview, Zebari said "Chalabi actually, still in my view, can play a role. He had fought a regime change for many years, he has been very consistent and steadfast in bringing many people to believe in this cause." "We feel a bit distressed by the recent difficulties, although we are not in a position to make any judgment. I think the security agencies of the United States are more capable to decide, but I personally don't believe Chalabi has any interest whatsoever to undermine the United States' national security." Zebari welcomed the endorsement of the interim government by Iraq's most influential Shiite cleric, Grand Ayatollah Ali al-Sistani, saying it was a "positive and important signal." The revised draft - the second try at reaching consensus – says the mandate for the multinational force will end with the installation of a government elected under a constitution to be drafted later this year. That installation isn't expected until December 2005 or January 2006. Zebari said he opposed "a fixed deadline or timetable" for the multinational force - something Algeria, Pakistan and China have called for. The 51-year-old Zebari was peppered by questions from Security Council members eager to get Iraqi input on the resolution as they debate the wording. He said the resolution must ensure that Iraq's self-rule isn't compromised while enabling the multinational force to defend itself. Zebari told CBS News "I think we need this resolutions to come out as soon as possible to be acceptable – first and foremost to the people of Iraq, and then to other countries. We need good language in this resolution... to tell the Iraqi people that this is real, this is not cosmetic. I have felt with my discussions that there is every desire by the United States, Britain, and other members to achieve that." The new interim government doesn't want "a fixed deadline or timetable" for the departure of the multinational force, he said, because it would be used by the country's "enemies" to foment unrest. The foreign minister stressed, however, that the transitional government that will be elected in January 2005 "must have a say in the future presence of these forces and we urge that this be reflected in the new resolution." The revised draft states that the mandate will be terminated if requested by the elected transitional government. Security Council ambassadors welcomed Zebari's comments but many continued to press for changes and said they wanted to hear from other Iraqi leaders. Pakistan's U.N. Ambassador Munir Akram said the references to sovereignty need to be strengthened and there needs to be "a clear reference to Iraqi authority over the armed forces." More discussion is also required on other issues, including the termination date for the multinational force, which he said is "still insufficient." U.S. and British diplomats expressed confidence that the council's differences could be overcome. Other nations on the 15-member council, especially France, were in no rush. They want to see how Iraqis react to the new team and were looking forward to a briefing from U.N. envoy Lakhdar Brahimi at a retreat this weekend in Long Island. The revised U.S.-British draft introduced Tuesday would authorize the multinational force to remain in Iraq under a unified command and urge more countries to contribute troops. Zebari, Iraq's first Kurdish foreign minister, called for more specific language on sovereignty, security and especially the military relationship. The new government wants "a clear reference to the status of the multinational forces, their operations, their relations with the Iraqi national government," he said. Zerbai also said his country is concerned about terrorism from within its own borders. "The existence of terrorist groups and networks in Iraq is a reality. There is … an international coalition of terrorists who have entered Iraq to do their holy or 'jihad' war against the coalition, and against the Iraqi people. They have killed more innocent Iraq civilians than coalition members. And these people really are the dark forces of history and they will have no future in derailing this process. "This is not American propaganda. It's real, we feel it, we sense it, we live through it every day in Baghdad. "